In 1035 AD The Shangpa Lineage was established in Tibet by the Great Yogi Translator, Kongpo Naljor, visiting India 7 times during the time of the high middle ages in Europe, seeking the meditations and teachings of the Buddha Dharma then still flourishing in Great Buddhist Universities. New Winter Schedule: Sunday Morning Meditation weather permitting. We will return to our regular full-time hours this spring. Please check schedule for more information. Announcing His Eminence Kalu Rinpoche's 2019 Event Schedule. Palden Shangpa Vermont , under the Direction of H.E. Kalu Rinpoche, provides access to the Wisdom Teachings of the Buddha through the preservation and practice of the Shangpa and Kagyu Lineages of Tibetan Buddhism. Weekly group meditations, visiting teachers, Dharma study groups and space for individuals to practice yoga and personal meditation are offered in an atmosphere conductive to the development of a respectful and nurturing Sangha community. Please consider Gifting Dharma Books to share with Others. 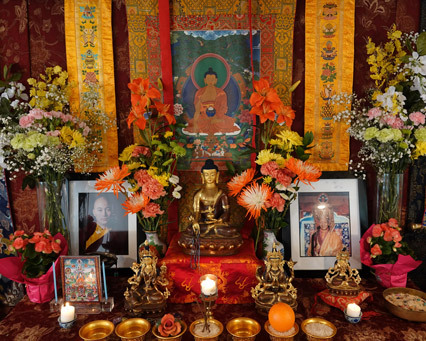 Palden Shangpa Vermont invites you to visit our Calais Dharma Center and enjoy the use of small Reading Room to preview and study a growing list of donated Dharma Titles. Many books are old ,long cherished and passed on to friends. Some new Donation’s including the complete 12 vol set of Jamgon Kongtrul’s “Treasury of Knowledge; Foundations of Buddhist Study and Practice. A recommend study for advanced students.